If you think that Guantanamo is hell on earth for criminals who are locked up for heinous crimes, you may swallow your words when you find out how those accused of committing a wrongful deed and asserted by the ruler came to meet their end. In short, inhumane is the word of the day. From maiming to boiling the perpetrator alive, there are the most shockingly creative ways that justice was apparently served. You will be glad to be living in modern times where being thrown in a jail with a tub of petroleum jelly is the most scary part of serving your sentence. Sounds like a metal band, no? 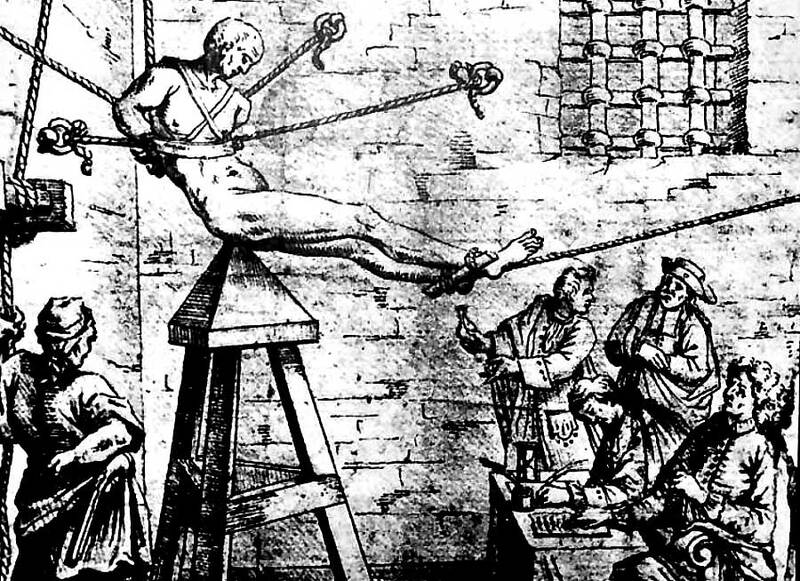 Well, this is no Iron Maiden, this is a medieval torture device known as the Judas Cradle. The victim was tied by the hands and legs and made to dangle above the pyramid-like structure. As the person fell asleep and his/her body began to relax, the tip would poke the genital area. This device was used for those who were accused of being against the Catholic church or following paganism. You wouldn’t get impaled altogether, but the slow force of the pyramid head would hurt the gentle human parts. Game Of Thrones fans would be familiar with the scene where Arya Stark, Gendry and Podrick are locked up in Harrenhall and where she is picked up by Tywin Lannister to be her cup bearer, but not before she witnesses random prisoners being picked up for torture. One of the methods was the infamous rat torture. The person was made to sit with a bucket of rats tied to his/her stomach. The end of the bucket was slowly heated and the scurrying rats would literally gnaw their way out of the scalding bucket through the person’s abdomen, resulting in a scary death of torn guts. Another horrifying and slow death was meted out through the Brazen Bull. As the name suggests, a hollow carved brass bull was placed over a fire and the victim shoved inside. As the bull heated up, the person would literally be roasted alive inside the bull, while tube fittings made their agonized screams sound like a raging bull. 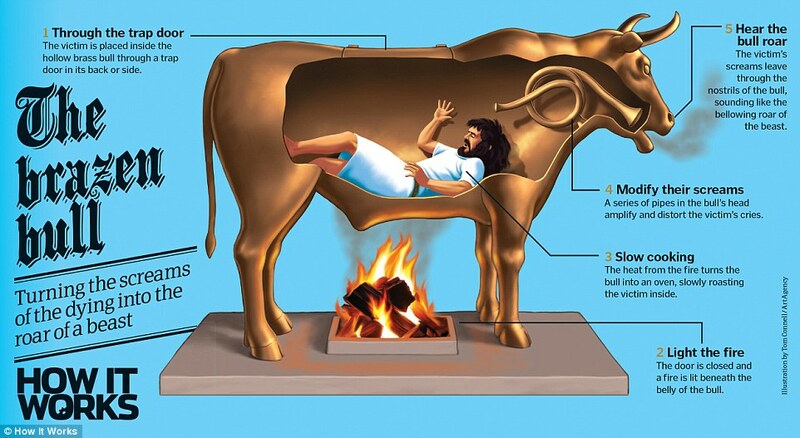 It is said that the creator met his end through his own invention, after he was craftily led to enter the bull by an appalled king who was justifiably shaken by the creation. However, many victims would later be led to their own heated fate in a similar way. So, since we spoke about this earlier, we need to “Up The Irons!”. Here is another torture device made of nightmares: think, sealed in a spiked coffin. And no, it isn’t punk mummy art. 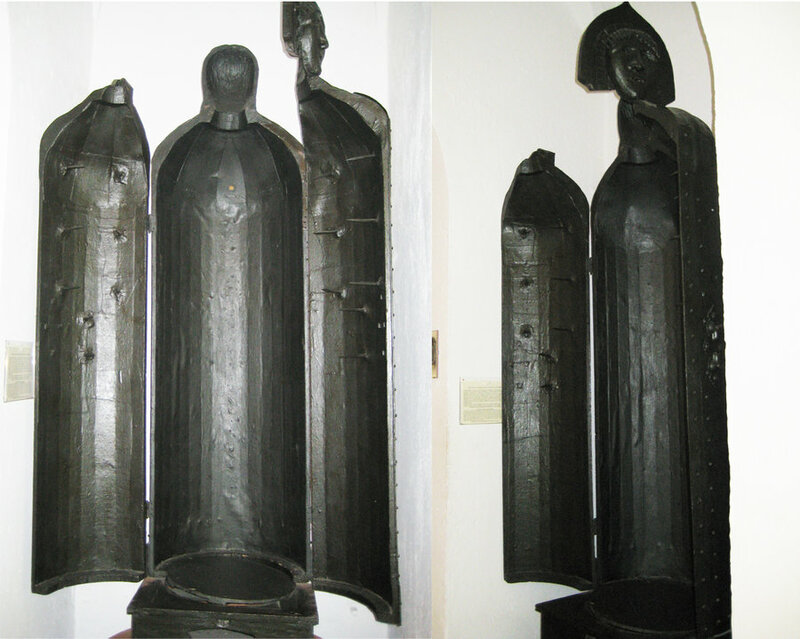 A standing iron coffin shaped like a human was where the prisoner was led and then the coffin door would shut tight, causing the victim to be nearly suffocated in the small space, not to mention speared through in the front and back. It would take a while before the person bled out or ran out of oxygen, whichever happened first. Good news, if any, is that there is no sufficient evidence to suggest anyone was made to endure the maiden. Braveheart comes to mind when one thinks of this method of torture. 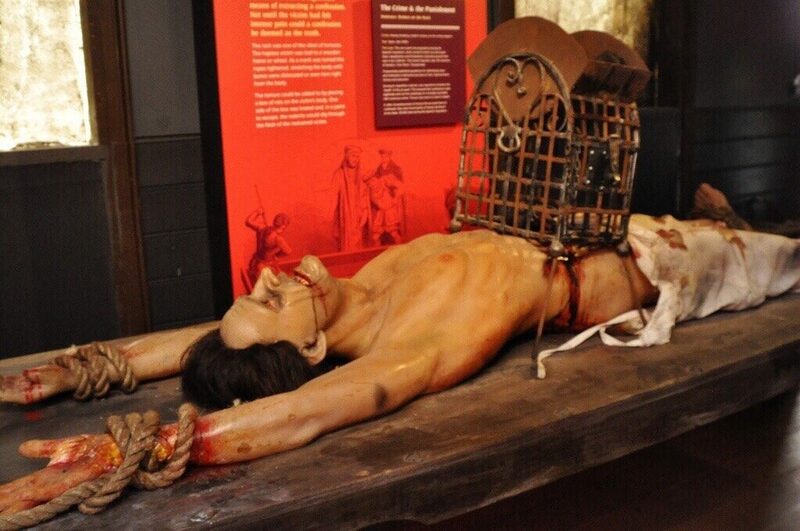 During the Medieval ages, the prisoner would be bound at both ends – the hands and legs and executioners would crank the ropes so that the victim’s limbs would be torn from their body in what would be a frightening way to die. Imagine the pain, suffocation and noise as you realized your own body was literally being torn apart. We all know the modern water boarding torture maneuver by interrogators today. In the past as well, water was used to harm victims and lead them to a slow death, but not before going completely insane in the process. The Chinese, known for their twisted ways of meting out a painfully prolonged death, used to tie a victim’s head in a small box-like device and drops of cold water would one by one drop on to the top of the head. It slowly froze the person’s brain, but not before they went mad with the sensation.